We are parked at the side of the road in an industrial estate on the outskirts of Figueres, where Kelpie stuttered to a stop! (42.23221, 2.96134). After our flat battery episode in Gruissan, we took the advice of the mechanic to do some driving to help charge the batteries. Well it was a mixture of his advice and what we had already planned. To make a break for the border and cross into Spain. While we were waiting things out in Gruissan, we had already selected out our next location. We wanted to book into a campsite for a night to get some much needed electricity to recharge our leisure batteries, and to be accessible if there was still a problem with the starter batteries. There are very few campsites open in the area over the winter so choices were limited, but we did manage to find one open not far into Spain between Jonquera and Figueres, which accepted the ACSI camping card at €17 per night including electricity. So with coordinates entered into satnav Sally, we headed off. After passing back through Narbonne, trying to avoid the dreaded 4 leaf clover junction, the drive was pleasant enough. But with light already fading, the views as we drove through the Pyrenees were limited. That was until we hit the first Spanish town across the border, Jonquera. We had been used to almost a month of tranquil picturesque French villages wondering if the population had disappeared to another planet for the winter. Not so with Jonquera! This place was buzzing. Filled with people, open roadside shops and flashing neon lights! A bit of a culture shock from a few hours previously. Most of the shops were selling alcohol and tobacco due to the active cross border trade and much lower prices than in France. Just through the town we passed a huge shopping complex with even more neon lights for (ahem!) saloons of the night. We then saw the reason for most of the infrastructure. Huge lorry parks filled with hundreds of 40 foot artics. Masses of filling stations set up especially for fueling these monsters heading both in and out of Spain with cheaper fuel prices. And an access point on to the first Spanish toll road with a constant stream of lorries going on and coming off the junction. It was like a scene from the wild west and the truck drivers were the cowboys with their wagons. Things didn’t exactly pan out as planned – we arrived at the campsite, Camping L’Albera in Capmany (42.37257, 2.91218) around 18.00. Our plan for easy accessibility seemed to have been thwarted. The campsite was down a dark narrow country road heading back into the hills. Again it was pitch black so we parked up in the first available pitch. As soon as Alan switched off the engine, he decided to try and re-start it – CLICK! We had driven 150 kilometers and the starter batteries were as flat as when we had left Gruissan! With it being pitch black and raining, there was nothing else for it but to set up for the night and sort out the problems in the morning. As we were setting up I became aware of an audience – the only other van in sight was a small caravan just below us. The guy in the van heard us coming in and pulled back his curtains. In the dark with his lights on we could see right inside his van. He was sitting watching us intently, with not a stitch on him – not a dolly – a sight imprinted on my brain for all time. You meet some strange people. When we got up the next morning the rain had stopped. The campsite was in beautiful surroundings with views back towards the Pyrenees, but we had more pressing matters to attend to so did not get any photographs. Alan phoned ADAC who kindly arranged another jump start and the recovery vehicle arrived within the hour. He had difficulty manoeuvering his lorry though trees on the campsite, into a position where his batteries were beside mine to attach the jump cables. ADAC then directed us to the garage where the recovery truck came from to have a look at the batteries and charging system for us, which was back towards the French border in Jonquera. After another juggling act through the masses of lorries, we arrived at the garage to be told we were too big for them to deal with and could we go to another garage. This meant heading to the far side of Figueres, again passing where we had come from. Figueres is the location of the Salvador Dali museum, but no visiting for us today as Alan was afraid to switch off the engine again in case it didn’t restart. We arrived at the next suggested garage to be told that their electrical mechanic was on holiday for the week so they couldn’t help us either Eventually with all other avenues closed we were directed to an actual Mercedes garage to see if they could help us – so another jump start and we were off. The Mercedes garage was in the middle of a huge industrial estate. After some sharp intakes if breath and a few shrugged shoulders they decided we needed a new alternator – great we said – go ahead and do that. “No podemos hoy” they said, not today we won’t have the parts until Thursday! We decided to go in search of something to eat and ended up in a small truckers café – our first meal out since we’d left Ireland and we were sitting in a lorry drivers cafe eating heated up seafood fiduea – I had always wanted to try fiduea de pescado, but sitting in a trucker’s café in the middle of an industrial estate was not what I had in mind as the experience! Now to see what the financial damage was. They had quoted us €600 which seemed an extortionate amount, with a new alternator in the UK costing just over £100, but we were sitting the night before Christmas Eve with no engine – we needed to get back on the road so we had little choice, and they knew it. It turned out the financial damage was considerably more than we’d expected. Apparently our job was “muy complicado” and took longer than they thought, pushing up the labour price. If you say it quickly it doesn’t sound so bad – €733. Forget that….. it sounds bad whichever way you say it! So what did you get for Christmas Michelle – a new alternator! I’d much rather have had a nice handbag but who am I to complain – we’re mobile again. 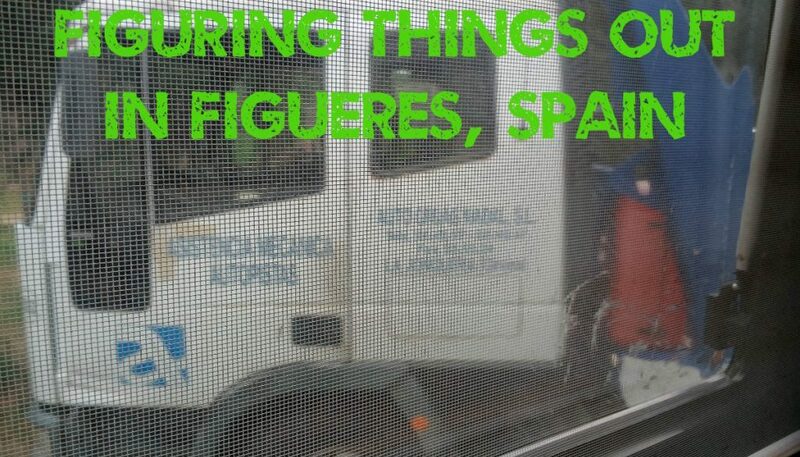 Now we just wanted to get out of Figueres quickly – so after refuelling at less than 1 euro per litre, we did something we usually try and avoid and headed for the toll gates to punch in some much needed miles for our journey south. Oh oh oh, what a nuisance! Good you could get on the road again before Christmas. Hope your alternator continues doing the job!